T-R PHOTO BY ROSS THEDE • The Marshalltown boys’ golf team poses for a photo in front of the scoreboard after defeating Johnston 94-66 in the Bobcat-Dragon Ryder Cup on Friday at Elmwood Country Club. Pictured, from left, are Cole Davis, Nate Vance, Lucas Schneider, Tate Carlson, Mason Reid, Luke Appel, Keygan Hansen and Conner Beaty. There were no frenetic fans decked out in red, white and blue, no overbearing celebrations nor beverage-soaked trophy presentations. The first Bobcat-Dragon Ryder Cup was all about competition and camaraderie. 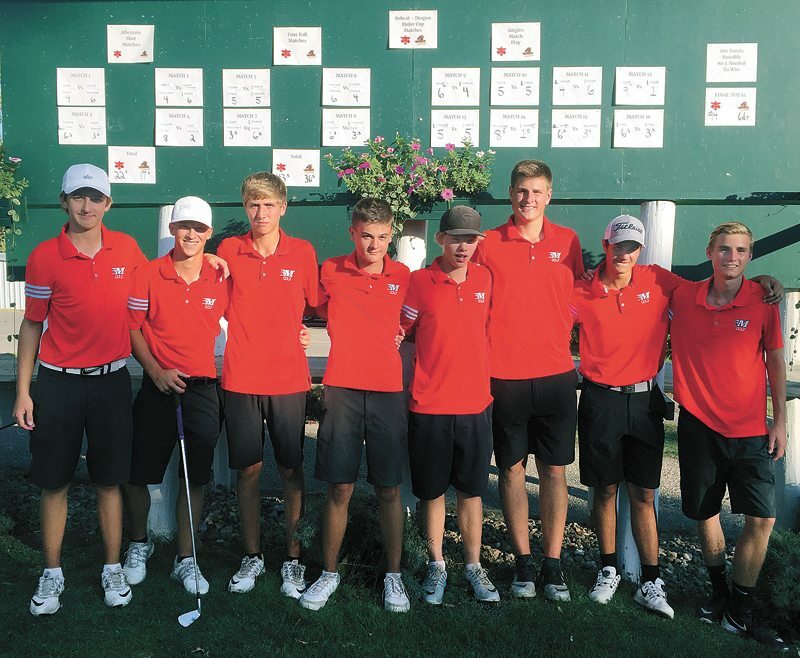 The Marshalltown and Johnston boys’ golf teams took advantage of an open date on their schedules and squared off Friday in a Ryder Cup-style showdown at Elmwood Country Club. The top-ranked Bobcats showed off their top-tier talent and roster-wide depth in handily defeating the second-ranked Dragons, 94-66, in a 27-hole clash that spanned nearly 8 hours in 90-degree heat. 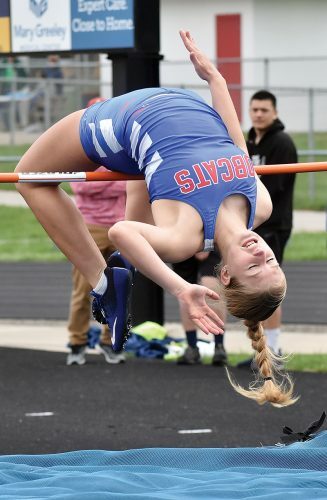 The non-traditional event was the brainchild of both teams’ coaches, who had an open spot on their schedules after Mason City’s Mark Mann Invitational was rained out one month earlier and never rescheduled. Each team put forth a lineup of eight golfers for three different nine-hole competitions, with the winners collecting a bonus point in each contested match. Marshalltown’s success in this Ryder Cup format stemmed from points scored in the lower ranks as both team’s elite players absorbed each other’s best shots in a high-level standoff. 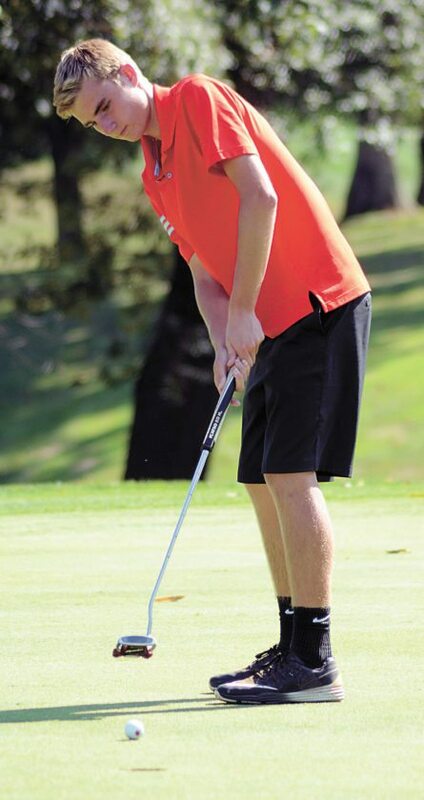 T-R PHOTO BY ROSS THEDE • Marshalltown sophomore Lucas Schneider sinks a birdie putt on the 10th green during the match play portion of Friday’s Bobcat-Dragon Ryder Cup at Elmwood Country Club. Schneider defeated Johnston’s Joe Paul in their singles match, 6 1/2 to 3 1/2. The day began with four alternate shot matches and Johnston had a 12-8 lead after the first two groups completed nine holes. The Dragons’ Nathan Petrak and Nick Pittman took a 6-4 victory from Cole Davis and Nate Vance, and Johnston’s second pairing of Brady Breen and Caleb Peters picked up a win over Marshalltown’s Luke Appel and Mason Reid by the same score. 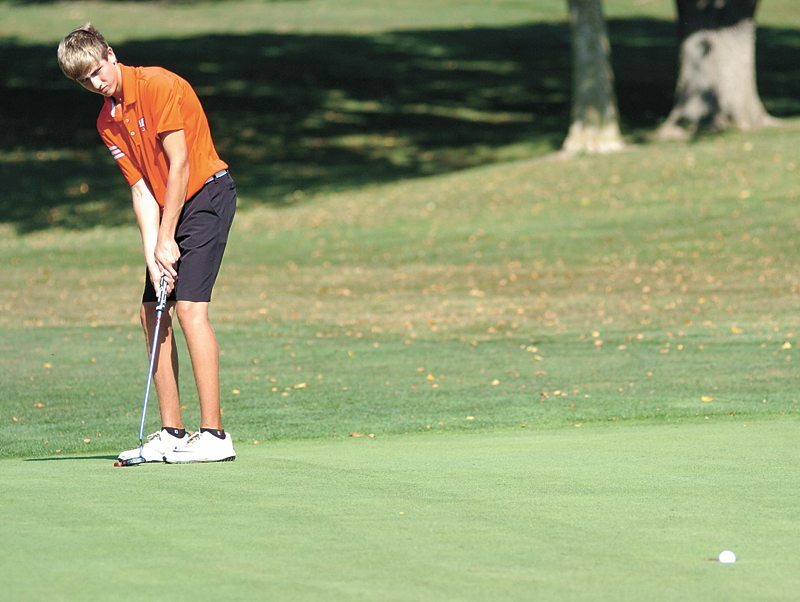 The Bobcats’ widespread talent took over from there, as Tate Carlson and Keygan Hansen captured a 6 1/2-3 1/2 win at No. 3, while Lucas Schneider and Conner Beaty earned an 8-2 triumph at No. 4. 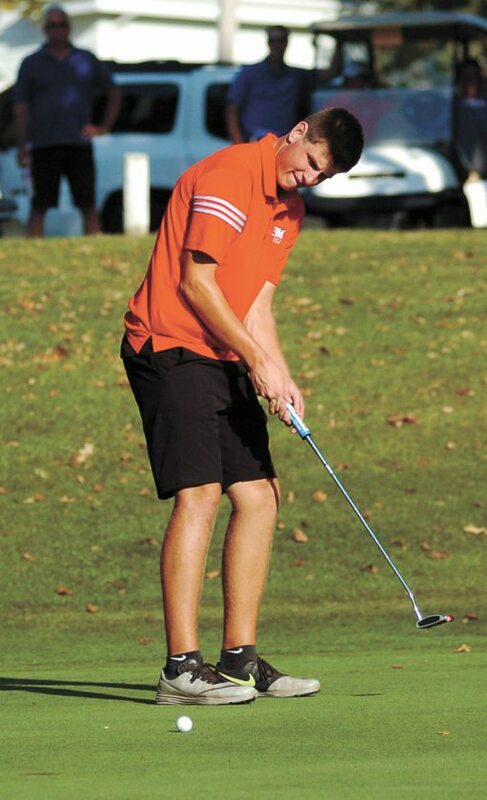 Marshalltown moved into four-ball play with a five-point lead in the team tally, 22 1/2-17 1/2, and never looked back. The Bobcats went 2-1-1 in four-ball competition, highlighted by another big win from Beaty and Schneider, 6 1/2-3 1/2, at the No. 4 spot. The Bobcats’ advantage stretched to seven by the time singles competition began, and MHS went 5-1-2 in match play to power its way to a 50 1/2-29-1/2 triumph in the third and final phase of the event. Appel picked up the most convincing of Marshalltown’s five singles wins, defeating Akansh Gupta 9-1. Appel’s playing partner for the first two sessions, Reid, was equally as dominant, prevailing 8 1/2-1 1/2 over Jarred Bowser. Both Schneider and Beaty bagged 6 1/2-3 1/5 victories, while the other four contests were a veritable draw. Davis defeated Pittman 6-4, while Vance and Hansen both halved their matches. Carlson was edged 6-4 by Petrak. “It seems a lot more personal between you and the person you’re playing against because in a normal 18-hole match, you really don’t care about what the other people are doing,” said Appel, “but in this match you’re almost watching their every shot, and if they do have honors you want to make sure they hit first so you can see what they do. “It was fun the last nine [holes] I played, but I was struggling there for a little bit. I got tired, I’ll admit it. “It was a fun way to end the season and we were successful. 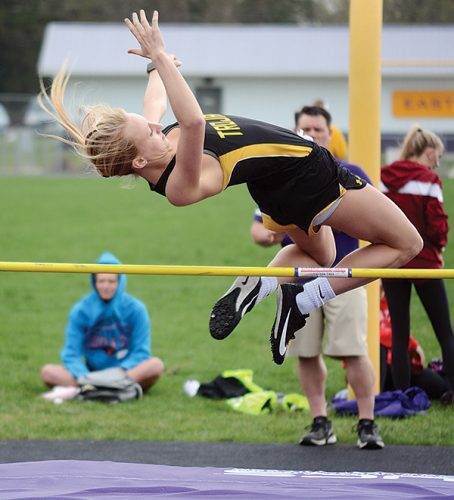 It would have been a lot of fun to get a trophy, but coach didn’t live up to my expectations,” Appel added with a smile. 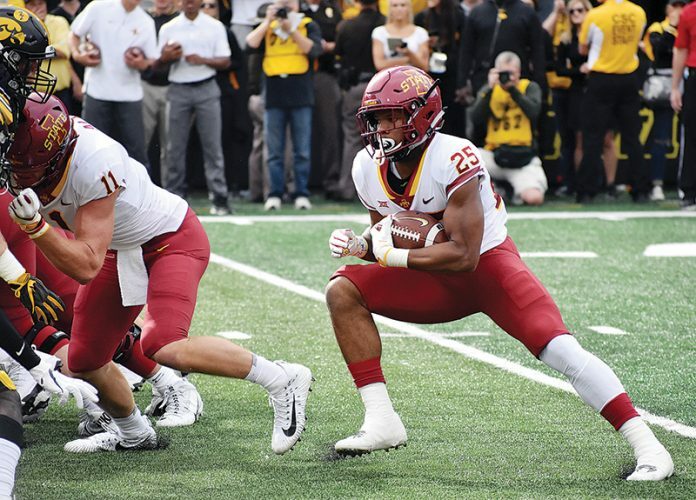 For both Johnson and Johnston coach Steve Smith, it was less about gamesmanship and more about sportsmanship. “What I was watching for and what I wanted to see was team chemistry taking place, and when you see guys fist-bumping and high-fiving after shots and you see guys trying to pump each other up when they’re maybe a little bit down, that’s the whole point of a day like today,” said Johnson. “From that perspective it was a success. Smith wasn’t at all concerned with his team’s fourth loss in as many run-ins with the Bobcats this season. 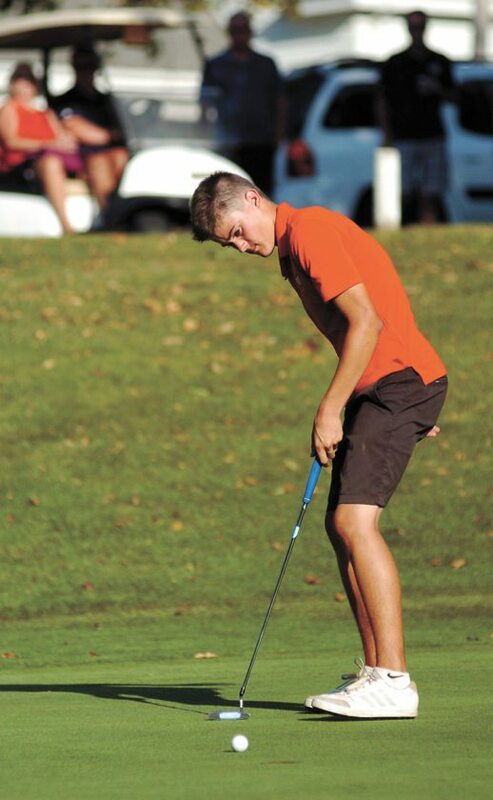 He was simply glad to get another chance to see the Elmwood course — the site of this year’s state meet — in chase his Dragons earn a return trip to Marshalltown the first weekend in October. “I think it was a good day for all of our kids to show good examples of golfers, and I think they all had fun,” Smith said. “I know a couple of my kids got tired, but I think it helps us because if we can make it to the state tournament, the kids have now played [Elmwood] a bunch more times. The Bobcats and Dragons will square off yet again at Wednesday’s CIML Iowa Conference tournament at The Legacy Golf Club in Norwalk. Tee time is set for 9 a.m.
T-R PHOTO BY THORN COMPTON • Marshalltown junior Jonathan Hernandez (17) hauls in a 38-yard pass from quarterback Sam Irwin while surrounded by Newton defenders in the fourth quarter of the Bobcats’ 49-28 loss to the Cardinals on Homecoming. T-R PHOTO BY THORN COMPTON • Mashalltown junior Giorgio Diiorio (34) avoids Newton defender Aaron Bartels during a run in the first quarter of the Bobcats’ Homecoming loss to the Cardinals. T-R PHOTO BY THORN COMPTON • Marshalltown quarterback Sam Irwin (2) prepares to plunge into the line on his way to scoring a rushing touchdown during the second quarter in the Bobcats’ 49-28 loss to Newton on Friday.